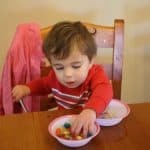 One of my favorite ways to create toddler activities is to gather up supplies I notice my toddler is interested in and placing them together as an invitation to play. 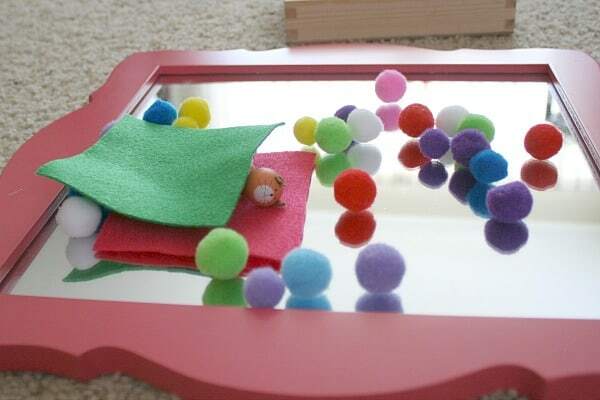 This toddler activity uses just three materials- some pompoms, a mirror, and a cardboard tube left over from wrapping paper. 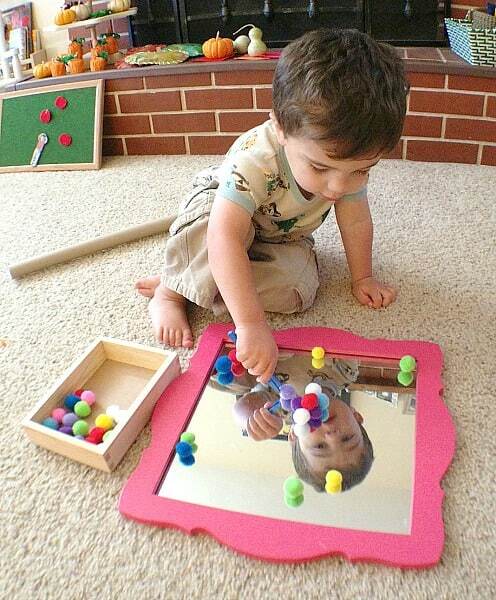 Follow our Toddler Play and Learning Pinterest board! 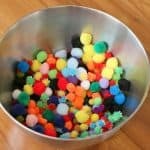 I was picking up the pom poms the kids and I had used yesterday for crafting when I remembered how much Theo, my 2 year old, had enjoyed playing with them. 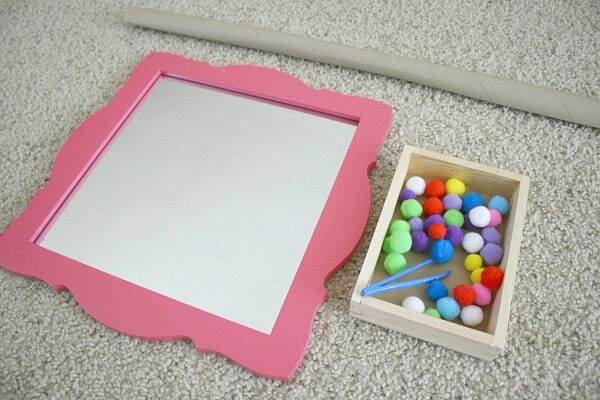 They would be perfect for an invitation to play! I grabbed some tweezers (similar to these) from my science cabinet and added them to the little wooden box of pom poms. Then I started looking around for a good surface for Theo to play on. How about that mirror in our family room I’ve been walking around… and over… and tripping on for the last couple months? Perfect! 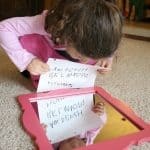 (So, yes, the mirror we used in our feelings center a few months back is still cluttering our family room. I like to tell myself I’ve left it out so the kids can use it to play, but really it’s been pure laziness on my part.) And the last item I added to the invitation was a cardboard tube from a wrapping paper roll. I set out all the materials on the ground where Theo could easily access everything. Disclaimer: If doing this activity with children under 3, use materials that do not post a choking hazard. Never leave your child unattended. 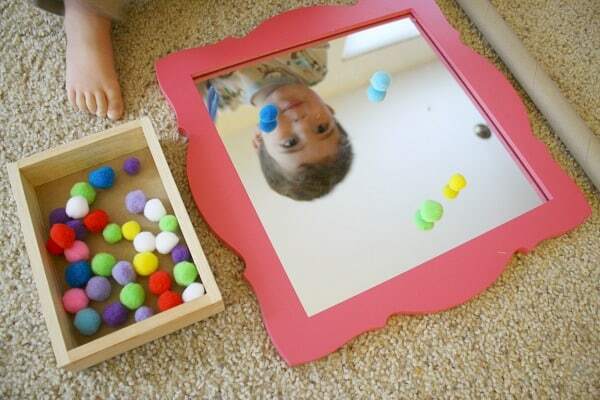 Theo started out by picking up the ‘balls’ (which is what he calls the pom poms) one-by-one using the tweezers and dropping them onto the mirror. Sometimes we’d say the colors of each ‘ball ‘s he was doing this. 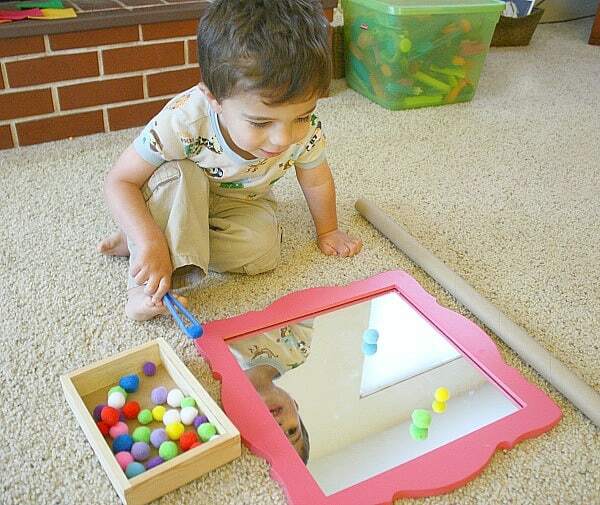 Once he had a good number of pom poms on the mirror, he liked pushing them around with the tweezers and watching in the mirror. Then he became interested in the cardboard tube from our wrapping paper roll. First he tried putting the pom poms into the tube while it was on the ground horizontally, but then he realized the pom poms wouldn’t come out unless he lifted one end of the cardboard tube up at an angle. He was very content dropping balls down the tube for quite a while! Eventually a little wooden cat ended up joining in the fun. Theo slid him down the tube numerous times while he yelled, “Meow”. 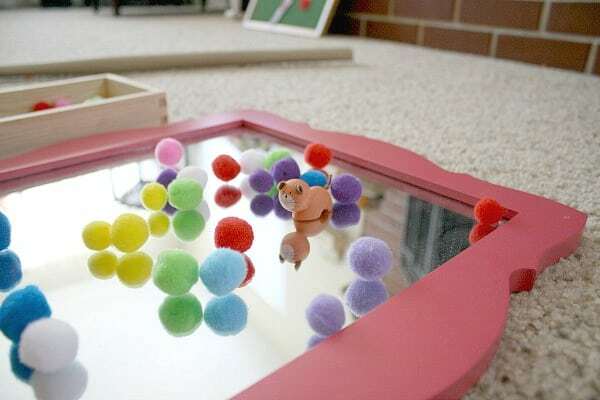 Then the kitty kicked the pom poms all around on the mirror. All that sliding and kicking must have worn wooden kitty out because Theo ended his play by putting him to bed under some felt squares that he found nearby. “Kitty night night,” Theo kept telling me. Seeing how much fun Theo had with just some simple things we had around our house was a good reminder for me that invitations to play do not have to be complex or even planned. 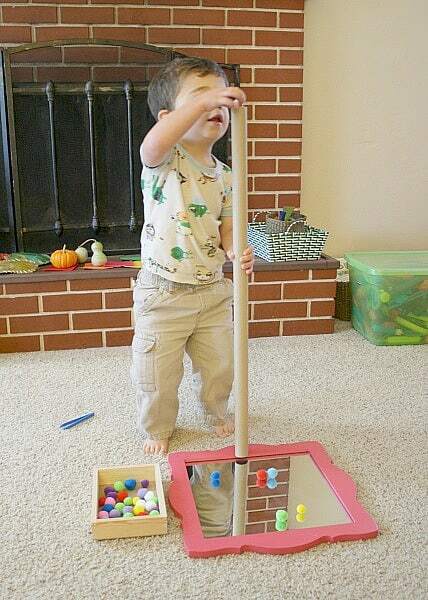 Just taking these random materials we’ve had in our house and presenting them in a new way was enough to inspire Theo to interact with the items. While playing with this invitation he also was practicing fine motor skills, problem solving, and using his imagination. Such a simple yet fun and intriguing idea. Definitely trying this one with Jake. Love the cardboard tube idea. 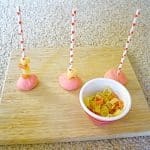 My little guys would love all these activities–pom poms are so much fun! I pinned it to my (CarlaINHouston) Toddler “School”!! board! Such a lovely reminder for me! 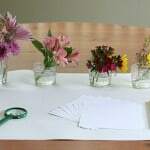 Sometimes simple, everyday items can be very inspiring when simply laid out in a new way. Great post! I love this idea! 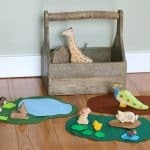 I have been looking for some learning activities for my baby that will be here by the end of the year. This will be perfect once he’s 8 months or so. Plus, my toddler will also love it. Thanks for the idea! Great idea! I love the approach of an invitation to play. 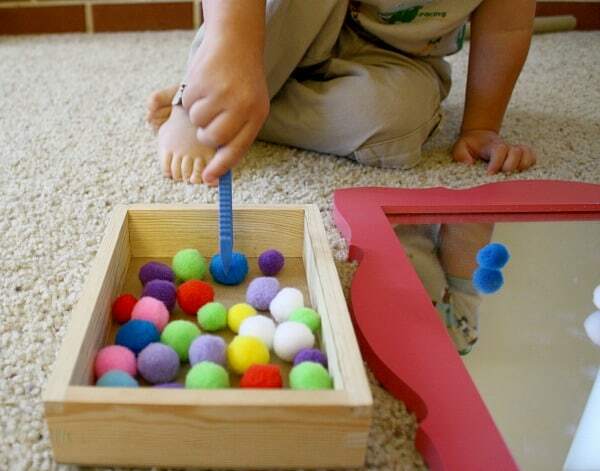 I am trying to get back into more sensory and activities around the house during the colder winter months. 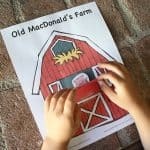 I remember during the holidays, I would let my toddler play with whatever I was doing at the time, like wrapping gifts (empty roll, paper scraps, etc.). 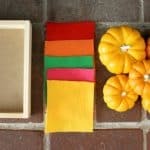 I’m going to try this activity!